As I was driving into the parking lot at work today I noticed several police cars throughout the neighborhood. Later I spotted a police helicopter circling the campus. Turns out an escaped burglary suspect had made off with a patrol car and abandoned it nearby. He also happened to be hand cuffed at the time. I have been thinking a lot about China recently. I am desperately trying to find my way back after a four year absence. It will happen; it is just a matter of time. 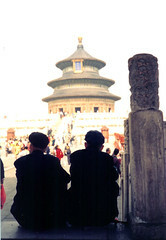 Here is a photo I took of two men visiting Beijing’s Temple of Heaven. The temple was built in 1420 and used for ceremonies preformed by the Emperor. For more see the following Wikipedia article: http://en.wikipedia.org/wiki/Temple_of_Heaven.